The ring was designed by my fiancé and our friend who owns a non-profit diamond business: The Clarity Project. They source only fair trade diamonds and invest all profits into mining communities. It makes it even more special! Ohhh yay! Congratulations. The ring is lovely :) Look forward to following along with your planning, especially since I'm getting married in June and am sure you will have inspiring ideas! Congrats!!! (good job, boyfriend, it's about TIME! hehe) xoxo. Congratulations!!!! I love the ring!!!! Congrats! Such a beautiful ring!! Can't wait to see how you plan your big day!! congrats congrats congrats! what a beautiful ring & you will be a stunning bride! Congratulations! That ring is gorgeous!! I got engaged this year so I can't wait to see how your planning goes and I'm certain you'll have a million beautiful inspiration pics. A new puppy AND a fiancee! Congratulations! Best wishes and congratulations!! It's definitely been a big month for you! Enjoy wedding planning and your engagement-it is such an amazingly wonderful and fun time. And the ring is swoon-worthy!!! Huge congrats to you and Joey! WOW What a gorgeous ring. Wishing you all the happiness, Taylor! congratulations- how exciting! your ring in beautiful! Congrats!! Marriage is wonderful. :) A new pup and a new ring...yay!! definitely looking forward to all the wedding inspiration! you'll make a beautiful bride! oh my word! congratulations!!! the ring is absolutely stunning and what a wonderful story behind it! cheers! WOW! This is so amazing! I literally, "AWWWWWWW"d at my screen when I read the little preview on my blogger dashboard. Congratulations! I am so happy for you two :) What a perfect start to the holidays, like you said! Congratulations! 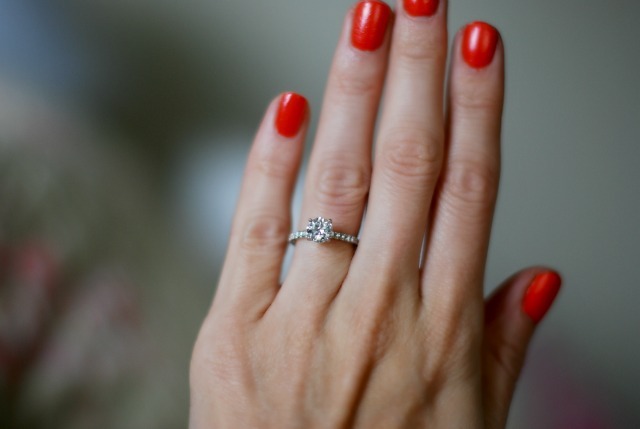 Love the story behind your beautiful ring! congrats! that's a gorgeous ring and i love how it looks against your nails. i love that it's fair trade too! Congratulations sweetie!!! You are about to embark on the greatest adventure in life and I hope you 'live' in every moment! Congratulations! What a special and beautiful ring! Congrats! Such a gorgeous ring, and even better because it has such a sweet background! So exciting Taylor. It makes the holidays even more special! Congrats! Your ring is beautiful! CONGRATS TO YOU HUN - MARRIAGE IS AMAZING!!! ahhhh! congrats! I keep waiting for this post :) such an exciting time! soak it up!!! you'll be such a beautiful bride! Congrats! I actually got engaged on the 12th too! SO EXCITING!! Are you buried in wedding questions too? LOL Enjoy hun! Congratulations! I had no idea that you knew the people are responsible for The Clarity Project-- I did a presentation on them for one of my social entrepreneurship classes!! So exciting! A HUGE congratulations to you! So exciting!! Marriage is the best! Best wishes to you and your beloved. Enjoy every moment leading up to the big day and beyond. So wonderful! Congrats. I love the ring and the mission behind the people who made it. Congratulations! I can't wait to see your wedding photos! Congratulations! I love the ring! Congrats! Love the ring and the store behind it. That's wonderful! Congratulations to you both! congratulations! a very rad way to start the holidays! Congrats to you both, Taylor! I know it might sound weird, but I'd been wondering when your boyfriend was going to scoop you up for life! Y'all sound like you have a really great, healthy relationship! Congratulations Taylor! That is fantastic news. Congratulations! Being engaged is an amazing time-ejoy every second! :) The ring is beautiful! Congratulations Taylor! The ring is beautiful and I can't wait to see your wedding planning chronicles! Oh congratulations dear!! All the best to you and your man! Congratulations! That is so exciting! Good luck on the planning! Congratulations and I'm so happy to hear that about your ring! I refuse to wear diamonds because of the mining industry, especially in central Africa, so it's nice to hear that :) So happy for you! Congratulations! I can't wait to follow along as you plan your wedding because I am starting to plan mine as well - can't wait to see your resources :) a little bit of cheating, but oh well! Have Fun! CONGRATULATIONS TAYLOR!!! I've been reading your blog for awhile and now and so happy to hear "he put a ring on it!" :) That ring is so beautiful and with such special meaning too! And so sparkly - befitting for the Glitter Queen! Congrats congrats! Awe! Congratulations Taylor! That's so exciting :) Your ring is gorgeous! What an amazing year you're having; the successful launch of Glitter Guide, a new puppy and a hubby! love it :) It's a pleasure to follow you on your journey, and I'm excited to see how you style your wedding! Congratulations!! So exciting and the ring is gorgeous!!! Aaahh romance at Christmas...could it be more perfect?! Congratulations! Congratulations!! Your ring is stunning! What a beautiful ring and story behind it. (Just don't do what I did and lose it, never EVER take it off ;) Congratulations - we all can't wait to see your plans! Taylor it's beautiful! So happy for you! My husband proposed 2 years ago on Sat and this time of year is always giddy and happy! You two are so perfect together! Omg! that's so exciting, can't wait to see all about the planning, congrats! Congratulations!!!! Ring is very pretty!!! Congratulations!! love the ring and the non profit idea! i so enjoy your blog and all of your inspirational tips! i'm so happy i stumbled upon it! thanks for sharing! So excited for you!!! Such a special time for you and your guy. Congrats Taylor!! Sending you so much love. YAY!!!! I'm so happy for you! You are going to make a stunning bride! Let the planning begin! Love your ring and The clarity Project! Wishing you and the fiance all the best! Congratulations!!!!! May God bless your union as he does your blog! Congrats!! So happy for you! girl....I am so beyond happy for you!! congrats!! Congratulations! The ring is beautiful! Congratulations!! What a beautiful ring. I am so happy for you! looking forward to hearing how your wedding plans shape up over the coming months. so happy for you! congratulations! I'm getting married this June, and I'm all about wedding!!! Do you have a date set yet? congratulations taylor!!! so excited for you two! What a beautiful ring congrats!!! I saw this on Instagram this morning but was too tired to type on my phone! Congrats, Taylor!! That is an amazing ring. I love the design-they did an amazing job. wauw what a great news! Congrats! congratulations, what wonderful news for you two! love that the ring is fair trade from a not-for-profit, makes it very special indeed - plus is a stunning design! :) Good luck with the planning! CONGRATULATIONS, Taylor! That's so exciting! And I love your pretty ring. Big congratulations,guys!Really happy for you) Can't wait to see some preparation details! Congratulations!! :) Such a beautiful ring. Congratulations! Your ring is amazing! Ooo la la, lady! So exciting for you and your man! Love the ring! *SCREAAAM* - i literally GASPED at my desk when I read this! Congrats Taylor! You're 1 of my fave bloggers & I'm so thrilled for you! Congrats! You ring is so beautiful!!! And I love this company, I'm spreading the word. Congratulations to you both! Your ring is lovely. Congratulations, Your ring is so gorgeous. so so happy for you and your man!! congrats!!!! enjoy every second. Just discovered your blog, great shots! Congradulations on the engagement! It's so lovely! Congratulations, lady. congratulation to both of you, love the fact the ring came from an ethical and humane source.